Hatshepsut, a women who held the position of Pharaoh in the 18th Dynasty, built a mortuary temple fit for any king. She took power at the sudden death of her husband, Thutmose II, and stepped into history. She assumed the role of Pharaoh and left her mark, which later was struck from the record like Akhenaten and Nefertiti some 200 years later. Matija Grguric has brought her temple to life. Deir el-Bahari is in western Thebes, and was inspired by the funerary temple of Mentuhotep II. Hatshepsut herself was buried nearby in the Valley of the Kings, and believed to have been lost to the sands. Edit: This creation, along with the others in his Civilization series, are now available for your support on CUUSOO! If this was an Architecture set, I would totally buy it. I agree. I want one of these on my shelf. 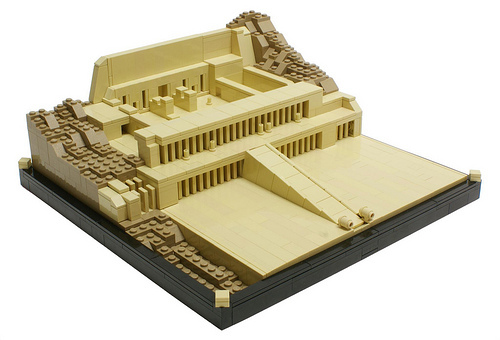 Matija has just posted this and some other creations on Cuusoo as the Ancient Civilizations project. Go support it and have a chance of buying one for yourself! !